Claudia grew up in Boulder and graduated from Fairview High School. She attended college at Harvard University and law school at the University of Pennsylvania, where she earned a full-tuition Public Interest Scholarship for demonstrated commitment to public interest law. She and her husband, a public high school teacher, live in Denver and have two college-age children. 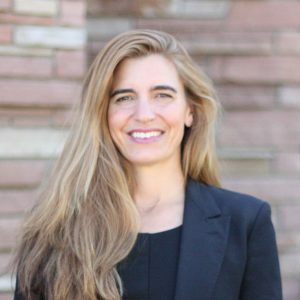 Since graduating from law school in 1993, Claudia has served as a public interest attorney in Colorado. She began her legal career with the trial and appellate offices of the Colorado State Public Defender, where she represented the criminally accused. Claudia works as a managing attorney in state government, and over the years has led attorneys representing a wide variety of state agencies. Currently, the attorneys on her team represent the state agencies that license, regulate and tax marijuana and liquor businesses, and additionally provide legal services to any state agency facing bankruptcy-related legal issues. Claudia is a trustee with the Brett Family Foundation, which was created by her father and step-mother. She also serves on the board of directors for Mi Casa Resource Center in Denver. Claudia has supported FOCUS Reentry through Foundation trustee grants for several years and has served on its board since 2014. With over 30 years of experience in criminology, Joanne is a recognized expert in the field, and is the author of the book The Invisible Woman: Gender, Crime and Justice (currently in its 4th edition). She is a Professor of Ethnic Studies at the University of Colorado-Boulder, and a past President of the American Society of Criminology (2013-14). She is the first faculty member at CU-Boulder to implement Temple University's Inside-Out Prison Exchange program, where undergraduate students and prisoners take a college class together in a prison. Joanne implemented this for the first time at Denver Women's Correctional Facility and for the first time at Colorado Correctional Center (a men's prison in Golden, CO). She has served on state advisory boards for offenders, been a member of Women in Prison Committee of the National Association of Women Judges, served on the U.S. Attorney General’s Violence Against Women Committee, gave expert testimony to the Warren Christopher Commission investigating the Rodney King police brutality case, and served as an advisor for presidential candidate Obama’s Criminal Justice Policy Recommendation Committee. Joanne has received numerous teaching, research, and service awards, including the Boulder Chamber of Commerce Women Who Light the Community, for her work in Focus. She has an M.S. and Ph.D. in Criminal Justice from Michigan State University. Joanne joined the board of Focus in 2012. Jennifer Sullivan is a graduate of Case Western Reserve University and Duke University School of Law. She clerked for the Honorable W. Royal Furgeson, Jr. of the United States District Court for the Western District of Texas before relocating to Colorado. Jennifer became a litigator at the law firm Faegre Baker Daniels, where her pro bono practice included prisoners’ rights and civil rights, familiarizing her with the many barriers people face after incarceration. Now the Senior Assistant Dean for Administration and Program Development at the University of Colorado Law School, Jennifer remains vitally interested in advocacy and social justice. In addition to Focus Reentry, Jennifer serves on the Advisory Council to the National Institute of Trial Advocacy. Jennifer lives in Boulder with her husband and their four children. Jennifer Sullivan joined the FOCUS board in 2017. Lynn is owner and president of Catalyst Communication, Inc. She is the founder and publisher of the BikeLife, Urban Streets, and Get Around series of print and online magazines for cities including Denver, Seattle, Boulder, Tucson, Anchorage, Cambridge. In 2015, the BikeLife series was named as a finalist for the top woman-owned new business in the outdoor recreation industry. Lynn has been the chair of the City of Boulder Transportation Advisory Board, the Boulder Board of Building Appeals, and the Emergency Family Assistance Association. She has served on the boards of the Colorado Fourteeners Initiative, Boulder Housing Partners Foundation, Democratic Women of Boulder County, and Intercambio Uniting Communities. In a previous life, Lynn was a practicing attorney and taught several classes at the University of Colorado Law School. Lynn joined the board of FOCUS in 2016. Jana spent a decade in Washington, D.C., working on Capitol Hill as well as for three federal agencies including the U.S. Departments of Labor, Justice (DOJ), and Health and Human Services. While with the DOJ in the mid-2000s, Jana was part of the movement that brought prisoner reentry to the fore; specifically, she encouraged the inclusion of mentoring among the services provided to those leaving incarceration. She was a public speaker at federal and White House conferences regarding prisoner reentry issues and federal grants. Jana holds a master’s in clinical mental health counseling. She oversees Denver Seminary’s Writing Center and is a freelance editor. Jana and her husband live in unincorporated Boulder with their young daughter, and has served on the FOCUS board since 2012. Jack Regenbogen works as an attorney for the Colorado Center on Law and Policy, where he advocates on behalf of low-income Coloradans. Jack has also served on the Colorado Collateral Consequences Work Group and Denver Welfare Reform Board. Previously, Jack has also worked with organizations such as Philadelphia Legal Assistance, Community Legal Services of Philadelphia, and the Homeless Advocacy Project, where he assisted low-income clients with a variety of civil legal issues. Before obtaining his law degree from the University of Pennsylvania, Jack received a Bachelor’s degree in 2012 from Colorado College, where he studied American History & Political Science. He has been a member of the board of FOCUS since 2017.